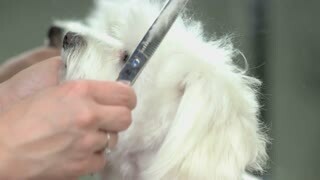 Dog groomer brushing white maltese. Small adorable dog. Cute maltese at the groomer. White dog getting haircut. Hands of dog groomer, scissors. Healthy white maltese. Pet health and beauty. 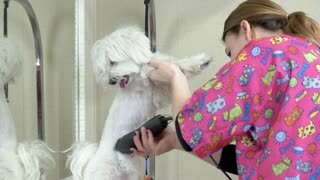 Dog groomer and white maltese. Cute animal getting haircut. Paw grooming, white maltese. Dog at the groomer. 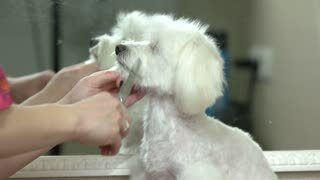 Hands with scissors, dog grooming. Adorable white maltese.